The LIBRARY includes a bar code labeling and reading system that automatically tracks each media element as it moves through the production process. 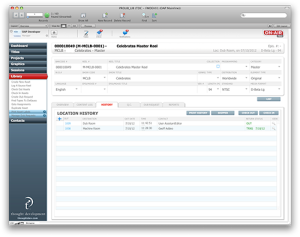 This absolute tracking minimizes the hassle of locating production materials by allowing you to search for the data within ON-AIR Pro™. Source material logging can be done by the writer-producer directly into the LIBRARY. 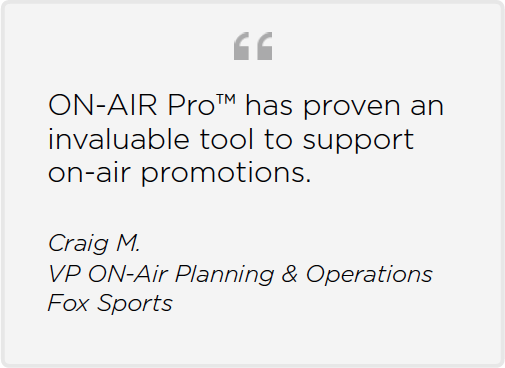 Logs for promo tapes are automatically built from the PROJECTS module, eliminating the need to manually calculate time code entries or re-enter promo information ever again! Integrates with Final Cut Server®. Tape shipment form with serialized numbers linked to the LIBRARY tracks shipping information and prints shipping receipts. Automatic individual and multiple-element check-outs can be performed without the need for bar-coding. 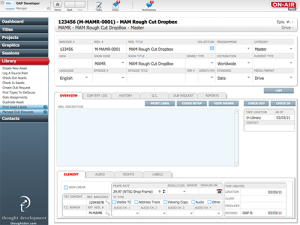 Revised shipping receipts with option to integrate with electronic signature pads (Windows workstation only).